You guys….today marks two quarters of my first year as a Speech-Language Pathologist. That’s pretty much half way. 10 blog posts ago I was complaining about tests and exams. Now, I’m complaining about too many progress notes and not enough hours in the day. Nothing quite like it – and I love it. I was talking to my Clinical Fellowship mentor/supervisor yesterday about when she was doing my next observation, and she apologized that she might not make it over before Christmas break. I was so flustered about finishing evaluations and progress notes, that I honestly forgot she was supposed to come. This wonderful woman has made herself available to me at any time. She’s set things aside to come and observe me. I am just thankful to have her time via phone/email, much less her making time to come see me. I would say 3+ years in the field and area you are working. For me, mine has 30 years under her belt. I want to wear that belt someday. Maybe she will bestow it to me. When a question arises, sometimes you just want an answer right away. Experience helps with answers. I don’t need a butler, maid, or neck-breathing sidekick. I need a person who will get back to me within 24 hours or less, calls me back, emails me, or texts me. Someone who will carve out a piece of time to observe me like ASHA requires (see quote). We all go through similar training to become a Speech-Language Pathologist. One thing I’ve learned in this short time is that what I know is just a drop in the bucket compared to my mentor and other long-standing SLPs out there. Caveman Katie, the SLP, needs to consult her textbooks on the regular. Ain’t no shame. But I want a mentor to have had similar experiences and feel more confident than I to help – or have the resource to help me find it. I need feedback. Positive and negative. I thrive on negative feedback. Someone needs to help a girl out over here. If I’m doing something that my mentor wouldn’t do, I want to know. Then I can change or ignore it completely (rarely would the later occur). I’m still fumbling around, so tell me where I need to fumble better. I’m coming to figure out that this year is about messing up, quietly thinking you’ve failed, consider quitting, and then having a good day. Those good days keep you motivated. And my mentor has made me feel more confident in myself and the skills that I have than I ever did in graduate school. There’s something to be said about a person who can do that. You can’t always pick your CF mentor, but when you can, look for people that have these things. Good luck out there! P.S. 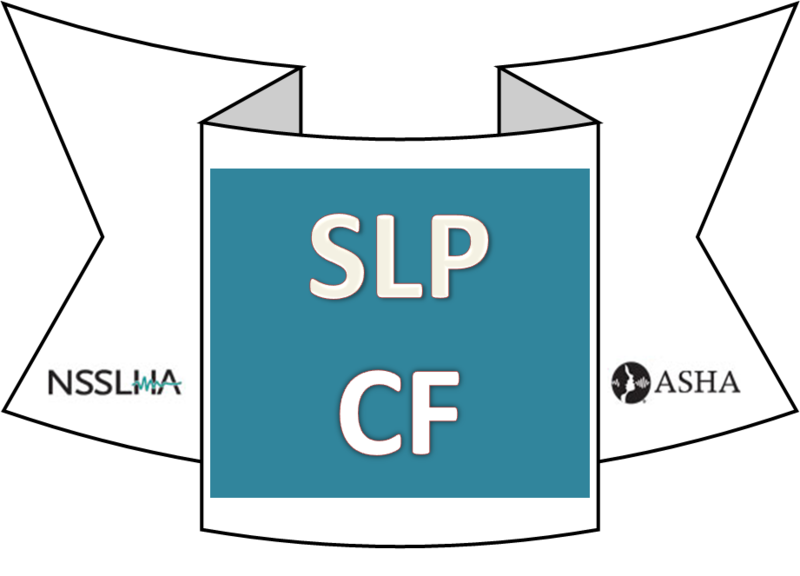 I quickly made this (crude) badge for SLP-CFs because ASHA/NSSLHA has badges for everything else, why not CFs? You can pay me later. Someone with graphics experience, feel free to contact me if you can do this better. Searching for an SLP-CF position: Start Now! As an SLP mentor I just love your thoughts. Thanks for sharing!! !